What is faceted search and why is it so important? By looking at some examples, let’s examine this trend and how it could impact on future user experience and digital strategy. Traditionally, faceted search is another name for faceted navigation, known predominately in our industry from ecommerce user interfaces. But, as championed in recent talks from Tom Anthony, Head of R&D at Distilled, faceted search is also being used to describe the rise of faceted information within the search engine results themselves. Rather than pushing you towards a website, Google often provides a direct answer or surfaces navigable information from the Google Knowledge Graph (now that Google is increasingly thinking about entities and their relationships, rather than keywords). This is search engines capturing more of the funnel, often using implicit as well as explicit data (e.g. context such as location). The card format has been around for a while and is often used to deliver answers in the SERPs. 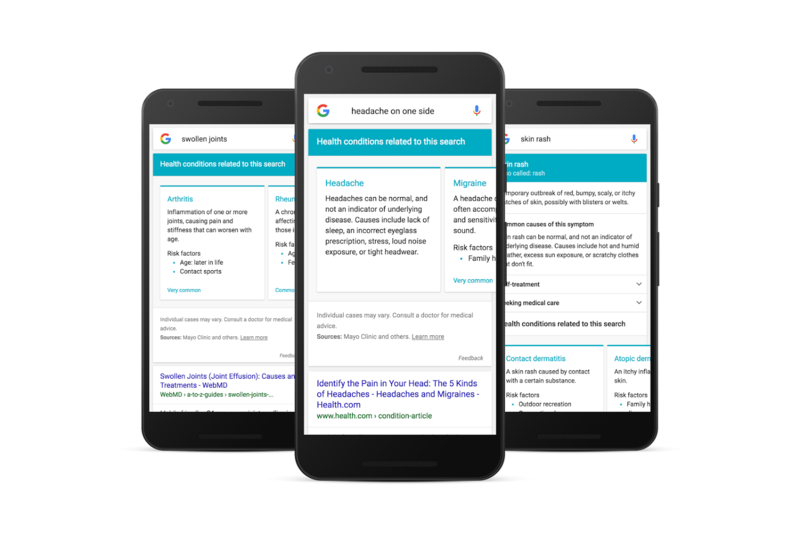 Below you can see three examples of searches for medical symptoms, and the answers Google returns from various websites. Note that several answers are provided on cards, which can be scrolled through in a carousel. Google has tested book an appointment markup in relevant knowledge panels. Clicking through takes the user to the appropriate landing page on the website. Google introduced richer cards to Google Shopping with Showcase Shopping ads (allowing retailers to present outfits and list products). With Shop the Look, an experiment during Fashion Week, Google has gone even further. Some broad Google Shopping queries trigger a slider of content featuring outfits put together by influencers. Users can click through and see each product from the outfit profiled on a page within Google Shopping, with links to each individual retailer. This allows shoppers to browse outfits and styles in the SERPs, before they click through to go to a website to buy a product. Noticed by Trent Cockerham early this year and detailed partly in a July 2016 update from Google, planning trips can be done within the Google SERPs interface. A combination of cards, radios and filters allows users to filter flights and hotels (by rating, price, dates) and define their interests for the trip. Users can also opt in to track fare changes within Google Flights, with notifications being received via email or Google Now cards. Why is faceted search important for marketers? In the first instance, providing Google with accurate information via Schema markup and structured data is increasingly important to aid conversion from the SERPs. But, as time goes on, faceted search will turn into something different, will become increasingly device independent, and searches will less and less often result in a visit to a website. Essentially, websites and apps (now being indexed and offered ‘instantly’ without download, via Android Instant Apps) may become publishing tools for some companies, but not the point of access for the consumer. This can be seen in conversational search and the emergence of intelligent personal assistants such as Alexa. Indeed, watch the video below about Viv, and you’ll hear the prediction that app stores will decline and marketplaces on voice activated personal assistants will predominate. That means that developers will have to provide information to services like Viv, such that Viv can learn to offer your services. So, if you’re not playing around with APIs already, maybe now is the time to start. Once your content has to be understood by machines, not merely presented to customers via a visual interface, this has dramatic implications for data and content strategy. As part of the London Design Festival, home improvement site Houzz has created its very own pop-up living space. Located in King’s Cross until the 25th September, SmartHouzz is a small, stylish and compact home, packed with smart features designed for city living.